As you might have heard, Amish are constantly starting new communities – about once every 2-3 weeks. But not every new Amish settlement makes it. Some attract dozens of families and last decades before dwindling to zero. Others muster just a few short years before economics, church struggles, or other factors send settlers on to new pastures, or back to the old. 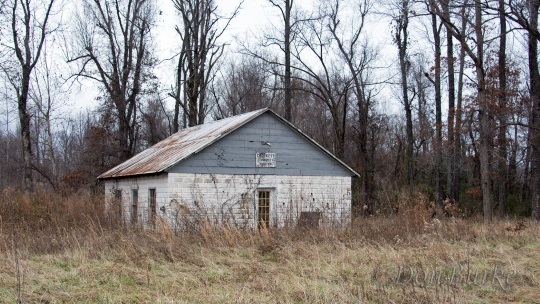 Don Burke recently visited a newly-extinct Amish settlement tucked away in a corner of Arkansas. Below you’ll find his photos and account of his visit, including some haunting shots from within an abandoned Amish school building. 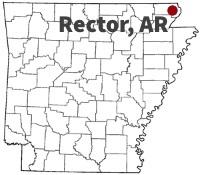 Like an iceberg adrift on the open ocean hundreds of miles from the nearest arctic ice flow, the hills and hollers of Rector in northeast Arkansas seem more fitting for the Ozarks foothills 50 miles away than the rice-farm flatlands of the region around it. And it was into these hills which are not unlike the rolling terrain of Holmes County, Lancaster County, or even parts of Amish Missouri that the Amish began to move in May 2009. But like the iceberg adrift in the warmer waters, all too soon the time came when this settlement melted away. The pictures here were taken recently of the homes and other places that once belonged to the Amish. The first to move into the area was the Amos Yoder family, coming from McKenzie, IN. 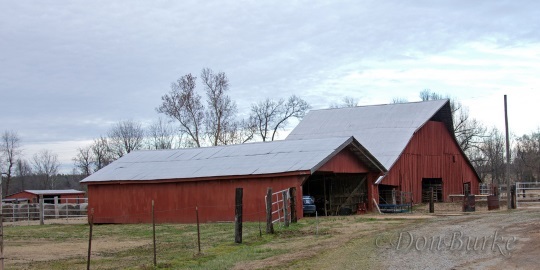 After renting another farm for a short while, the Yoders moved into this 76 acre farm just outside of town. The Yoders had a part-time bakery and apparently a greenhouse. The following November the only minister in the settlement (at least as of 2012), bishop Noah Hochstetler moved in from Tennessee. The next year the Hochstetlers moved to this farm which they co-owned with their son Paul and his family. 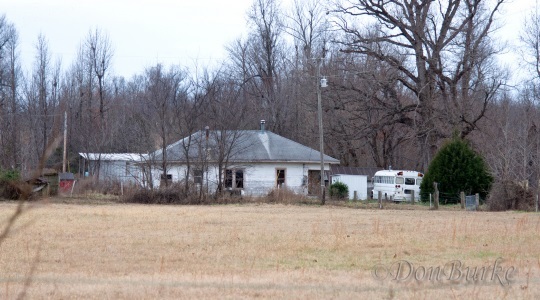 Also in 2010, three families of Yoders moved into the region from Cisne and McComb, IL, and rented a house on the northern edge of the settlement and another one nearby. Signs of their short stay are still evident. The Central Plains [Amish] Directory notes that in August of 2010 Tobias Yoder (a son from one of the Yoder families) “made a rather suspicious disappearance,” and reappeared a month later – with a bride from Bonaparte, Iowa! 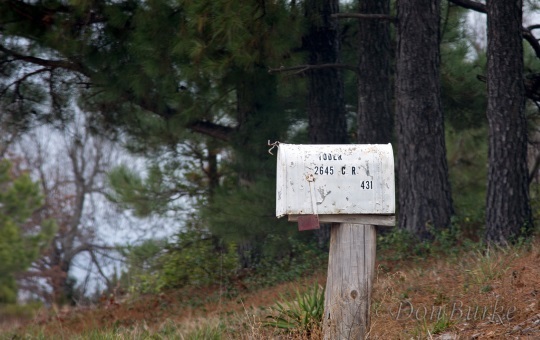 It then comments that she “…has been faithfully keeping house for him since.” This is the house they once lived in. In the first school year there was only one family with school-age children, so they were homeschooled. 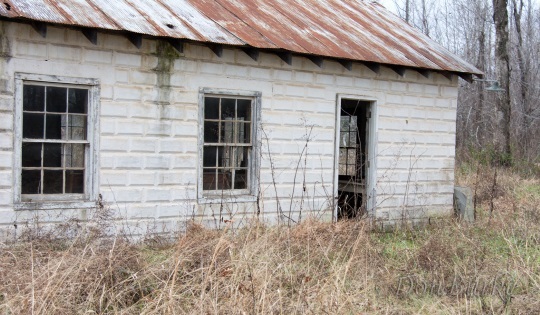 However the following year (2010-2011) – after some much needed repair and cleaning ­– the neglected Crockett Community Building was made into the one-room Crowley Ridge School. The school had eight Amish pupils that year, graduating one of those from the eighth grade that spring. But as the pictures shows, a short five years after Amos Yoder first moved into Rector the settlement is now an Amish ghost-town. According to a pastor friend who lives nearby and who was a patron of the bakery there, the Amish opted to leave because their anticipated plans for other Amish to join them didn’t materialize. This was especially a problem in that it left their children without other Amish their age to marry. It seems the individual families went differing ways – some moving back where they came from, others to be with family elsewhere, and at least one who moved to Illinois to be close to a hospital where their child was receiving extended treatment. 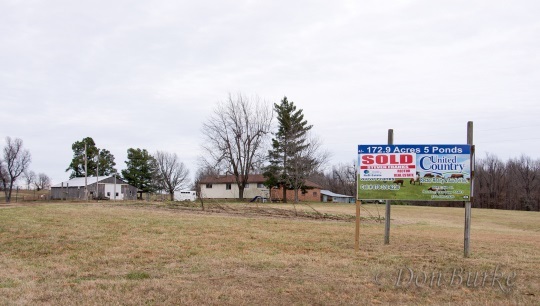 My pastor friend tells me that the last known Amish resident of Rector was one of the Hochstetlers, who was simply waiting for his farm to sell before moving. When I visited Rector the day after Christmas, it was clear that the place had finally sold and the Hochstetlers had moved on. This is interesting about an Amish ghost town. Many years ago we had a single Amish family who settled initially in the Blue Mountains west of Sydney. After a while, possibly a couple of years they moved to a town about three hundred miles or so north of Sydney called Nabiac. There they opened a business called “Amish Country Barn” and sold lots of Amish and Shaker items such as furniture, coasters and much, much more. I know because I bought quite a few of their products and they were very well made. Then, just as suddenly they disappeared and nobody knows where they have gone, or if they moved to Tasmania, (as the wife was originally from Tasmania, got herself in to trouble here and moved to the US where she met and became Amish – and married), or even if they went back to America. I’ve often wondered what happened to this family, and I especially wondered about several or more years ago when a party of five Amish men were said to have flown to Tasmania to look at the possibility of moving their entire Amish community from the USA to Tasmania. The then Premier of Tasmania was interested in finding out who they were and offering them business migration to Tasmania, but neither he nor I could find out who they were or where they had visited from. So, Amish ghost towns are of great interest to me. Hello from another bloke who's been down under! Hi Andrew. Back in ’82 I spent the summer (winter there) in Australia, working with some of our missionaries. I was on the other side of your little island, primarily in the Toowoomba area, but got to visit a number of places through that part of Queensland. Beautiful country there, and I’d love to go back with my camera some day. Thanks Erik for allowing me this venue to share some of my Amish experience. Thank you Don. We have written a decent bit about extinct Amish settlements over the years here, and even shared some accounts from David Luthy’s book on the subject. But we have never had photos to illustrate such a community, nor do I recall seeing anything online like that. Our district requires eleven or twelve families to join together for starting a settlement somewhere else, even if only 30 miles away. That ensures a community exists for worship, work, socializing, celebrating, emergencies, or anything else in daily life. It also helps ensure that the settlements succeed. Based on the narrative here, it sounds as though families relocated to this part of Arkansas by onesies and twosies. That sounds very un-Amish to me. Are there different settlement rules for Amish between different regions? Kenneth, the entry for this settlement in the Central Plains Directory describes the incoming Amish as “onesies and twosies” as you say. I presume that the entry is written by someone from that community, so I’m assuming it to be accurate. As to how much this is — or varies from — the norm, I am not in a place to say. It’s funny, even though I know all things come to an end, I have always had a hard time looking at ruins. (Don’t ask about the summer in college I spent on an archaeological dig in Israel!) When I’m out hunting, I sometimes come upon what’s left of a foundation of an old farmhouse or barn, and there’s a pang inside me as I think of the memories the place would tell us, if it could, memories now gone with the inhabitants. Trish, Erik and I were talking about some of that very same thing. With his permission, I’ll share an excerpt of what I shared with him…. 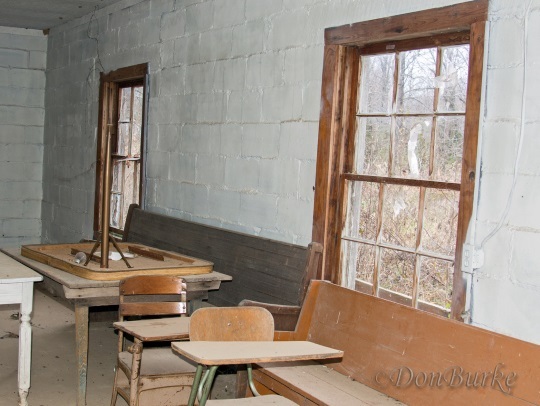 I, too, initially had somewhat of a sense of an emptiness feeling in going through this community — a feelings that are especially encapsulated by the once-enlivened-and-now-abandoned schoolhouse. But as I’ve thought about it I’ve changed my perspective a bit. This place now strikes me more as the cicada shell: if we focus on the shell it seems abandoned and lifeless; but if we focus on the life, we see that the shell was a temporary dwelling, but the life has simply moved on – and is still doing well. 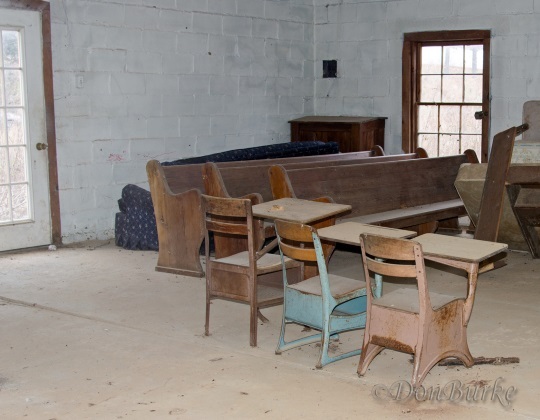 Focusing on the building evokes feelings of emptiness and sadness…, but thinking of the kids (the real life of the place) and knowing that they are likely doing their Amish thing just in some other place – well, it puts the empty shell in perspective. Don, what a beautiful metaphor of the cicada shell! I’ll have to see if it helps me enjoy historical remnants more. Im the same way as Trish.. though I enjoy ruins… I feel an aching sadness for what was & what is no more… Im terribly empathic though and feel others emotions strongly.. Its a gift & its a curse sometimes too..
Don, I agree with Trish on the cicada metaphor is a wonderful way to look at it.. When I read that, the ache I was feeling from the pictures was lifted and the butterfly was free.. Thanks for that! Beautiful! Kim (and Trish), I’m glad that sharing what helped me was helpful to you as well. I don’t know why but I quite like seeing abandoned places. Maybe it’s the sense of mystery they leave behind. Or the reminder they offer that all is fleeting. They don’t really bring me down at all. I think dilapidated or returning-to-the-earth objects and locales can even have their own…”beauty” maybe isn’t the right word, but something like that. How interesting (including the info you sent, Andrew, about Amish in Australia)! Since childhood, I’ve been drawn to “the old”—mummies at the Field Museum, artifacts from the Great Chicago Fire at what was then the Chicago Historical Society–now the Chicago History Museum), old family photos of my mother’s mother & family when they emigrated to the U.S. in 1904. Old things “speak” to me. When viewing old buildings such as those pictured here, I can feel the past (and the former residents) “speaking” to me. I personally feel people “infuse” their surroundings with a part of themselves—emotions, mainly—which become residual. I find it all intriguing! It seems from the cars in some of the photos, that the English are now using the properties. I hope the acreage (farmland) will be used well…and not simply developed into a new suburban subdivision! Thanks to all who’ve shared experiences here. We need more Amish here in Arkansas. My daughters saw them out at the sale barn in Salem some days. She was of marrying age, but after she didn’t see them anymore she left to move with family north. Very interesting pictures and narrative. Thanks for sharing. It’s interesting that the settlement is still listed in the 2015 Raber’s Almanac (Noah Hochstetler, bishop, is the only minister listed). I would imagine that the settlement will not be listed in the 2016 Raber’s Almanac. Yes, I think they might not get all of them updated in time, or the update comes after publishing cutoff, especially if the last resident sold just recently. There’s a small Amish community here in Texas near Beeville Texas that is slow diminishing. At once we did a lot of business with them, but since the there isn’t a big supply and demand for the products they manufacture an they aren’t as technological advanced then it’s hurting them. Roderick, those of us in Indiana’s “Amish country” have gotten used to going to the Amish when we specifically want something made the old-fashioned way, without too much in the way of technological advancement. Carpentry and quilt-making both seem to be especially in demand. Paradoxically, some goods that are sold (truthfully) as “made by Amish craftsmen” are made in English-owned shops using modern tools, but they ARE made by Amish, whose skills are old-fashioned even if all the techniques are not. It is so sad to see an Amish Community fall apart. I do wish that I had one close to me for I love buying their goods. We have a lot of Mennonites around us in this Northeast Texas area, but it is not like dealing with the Amish. The Mennonites used to have a fantastic bakery in Maxey, Tx and I used to go there and buy from them quite frequently. I would love to see an Amish settlement start around here and I would love to be neighbors with them. I know that they have to be in an area where they can meet others and have marriage potential to keep their faith strong. When I was a very young child, my family (and some relatives) moved to Tawahas NY, a company town where my father worked as a night watchman at the titanium mine. I looked Tawahss up yesterday, and found that it has become a ghost town! http://www.ghosttowns.com/states/ny/tahawusoradirondak.html I hadn’t thought about Tawahas for many years, but finding that it is “the town that was” makes me sad! The m in BillmRushby stand for “mistake”! And the town is Tawahas.